Landscaping to attract butterflies and other kinds of wildlife is called “wildscaping” and is a positive thing to do. Butterflies look lovely fluttering from plant to plant, but you should appreciate them for more than their pretty wings because they play a major role in pollination. Although less effective at carrying large quantities of pollen, butterflies travel greater distances than bees and pollinate broader areas. Modern Farmer magazine notes that they also are the primary pollinators for many herbs and vegetables. So how can you help these hard workers do their job? The answer depends on where you live. In Texas, the project of planning a butterfly garden can seem as big as the state while you gallop across the Internet trying to catch the right information for your region. There are 463 species of butterflies in the Lone-Star State, according to Texas Parks and Wildlife. Steering some of this herd of Lepidoptera toward your yard is easier if you know what butterflies frequent your region and which plants they favor for nectar and for laying their eggs. Three organizations that can help you get started are the Texas Parks and Wildlife Department, the Lady Bird Johnson Wildflower Center, and Flowers by the Sea. At FBTS, we grow a number of nectar-rich plants that are just right for Texas butterflies. Six families of butterflies call Texas home. They are Swallowtails (Papilionidae), Whites and Sulphurs (Pieidae), Gossamer-Wing Butterflies (Lycaenidae), Metalmarks (Riodinidae), Brushfooted Butterflies (Nymphalidae) and Skippers (Hesperidae). TPWD divides the state into six regions for which it provides lists detailing local butterflies as well as nectar plants and caterpillar hosts. But before we flutter in that direction, lets consider some details about the families. Swallowtails gain their name from the tails on their hind wings. They are large and come in various combinations of black, yellow and blue. Whites and Sulphurs are small to large butterflies that are, as their names imply, mostly white and yellow. Sulphurs love legumes whereas whites enjoy plants in the mustard family. Gossamer-Wings are small and grey. They include varieties called Hairstreaks and Blues. Metalmarks are tiny butterflies that don’t move around much. They are brown with shiny metallic markings along the edges of their wings. Brushfoots are one of the largest and most diverse butterfly families in America and include the Queens and Monarchs. They have 109 species in Texas alone. Their main colors are black, brown and orange. Some eat rotting organic material while others feed on flowers with shallow wells of nectar, because their tongue-like proboscises are so short. Skippers, which often are found in grasses, are sometimes mistaken for moths due to their small to medium brown bodies. They form the largest butterfly family in Texas with about 200 species. TPWD provides an Introduction to Butterfly Watching brochure online that includes Internet addresses for information on butterfly gardening throughout the state, which is divided into six regions. For example, the North Central Texas list includes Autumn Sage (Salvia greggii) as a nectar plant that attracts many kinds of butterflies, whereas Purple Coneflower (Echinacea purpurea) is noted as being tempting to Swallowtail, Queen and Monarch butterflies. In contrast, the Central Gulf Coastal Area reports that Coneflower doesn’t work well in its region due to the extreme heat. Both areas report Mexican Milkweed (Asclepias curassavica) – also called Blood Flower – as a top caterpillar food plant. The lists include some details about the plants, such as height at maturity, bloom times and whether annual replanting is necessary. The Lady Bird Johnson Wildflower Center also offers a wealth of data about nectar and caterpillar host plants for Texas and other parts of the nation. 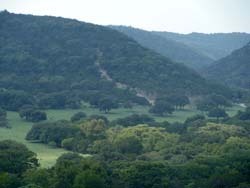 The Lady Bird Johnson Center, which is located in Austin at the University of Texas, includes the outdoor, half-acre Ann and O.J. Weber Butterfly Garden. Celebrating its 10th anniversary, the Weber Garden makes it possible to observe butterflies in a more natural setting as they alight on some 150 species of nectar and caterpillar plants. The nectar plants include Salvias, such as Pitcher Sage (known botanically both S. azurea var. grandiflora and as S. pitcheri ‘Grandiflora’), Cedar Sage (S. roemeriana), and Mealy Cup Sage (S. farinacea). Host plants that also serve as nectar sources in the Weber Garden, include a variety of Milkweeds (Asclepias spp.) and Parsley (Umbellifereae). Of course, butterflies wander beyond the Weber Garden to other parts of the Lady Bird Johnson Center. Plant profiles on the Center’s website indicate a number of other Salvias as being attractive to butterflies in search of nectar. Aside from Autumn Sage, these include Black Sage (S. mellifera), Muntz’s Sage (Salvia munzii) and Lyreleaf sage (S. lyrata). If you have favorite nectar and host plants, we would love to hear about them. Please contact us so readers can learn from your experience whether it concerns a Salvia or another butterfly favorite. We all benefit from the beauty and better pollination created by successful butterfly gardens. The Salvias were very healthy and full, packed with care, and arrived undamaged all the way from California to Rhode Island. I highly recommend Flowers By The Sea. Their customer service is excellent! The plants i orderd were shiped perfectly and are all growing great. thank you so much for the timely delivery. Everything arrived in perfect condition. We followed the instructions of allowing the plant to accumulate to the local climate in Texas. We planted them two days after we got them. The plants are doing very well with drip irrigation to the base of all 4. Now we wait for the flowers. I have ordered several salvias from FBTS and they have all arrived in excellent condition and are doing well in my garden. I love the variety available and the shopping experience online makes it easy to find the plants and colors I seek. Purchased plants as part of \"grew too much\" sale; plants arrived in good condition, and are adjusting well to the new home. The plants came promptly and were in beautiful shape, nice and strong for planting. They look great.